Learn all of the secrets and tricks of the trade to safely specify, fully enjoy, and appreciate stone for generations. 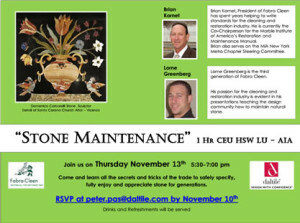 CEU presentation by Brian Kornet and Lorne Greenberg of Fabra-cleen. Brian Kornet,President of Fabra Cleen has spent years helping to write standards for the cleaning and restoration industry. He is currently the Co-Chairperson for the Marble Institute of America’s Restoration and Maintenance Manual. Brian also serves on the MIA New York. Metro Chapter Steering Committee. Lorne Greenberg is the third generation of Fabra Cleen. His passion for the cleaning and restoration industry is evident in his presentations teaching the design community how to maintain natural stone.